Best Home Golf Simulators Available - Detailed Reviews & Buyer Guide! Best Home Golf Simulators Available in 2019! How would you like to play world famous St. Andrews Links, the home of golf, whenever you want to? Or perhaps you’d like to give legendary Pebble Beach Golf Club a go, or dozens of other great courses from around the world. Sounds impossible, right? Well, unless you are independently wealthy, it probably is impossible. But there is another way that you can tee it up on these masterpieces without spending a small fortune on airfare, hotels, greens fees, etc. How? 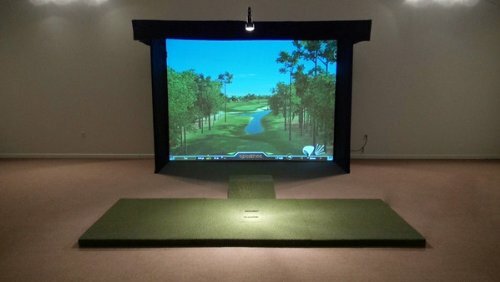 You can do it from the comfort of your own house, by installing a home golf simulator. What’s a home golf simulator? a computer that does all of the analysis and data gathering. To oversimplify it, golf simulators are like a giant video game. You first select a famous “virtual” golf course, which is then photographically projected, hole by hole as your round progresses, onto the screen. For those just wishing to practice, you can alternatively select the image of a driving range. You then hit real golf shots into that screen, while radar and light sensors analyze each ball and display its actual flight on the screen. This is where there is an instantaneous transition from the real world to the virtual world. You strike a real golf ball that travels just 10-15 feet into the screen, and the remainder of the ball’s full flight motion is then displayed virtually on the screen. How cool is that? 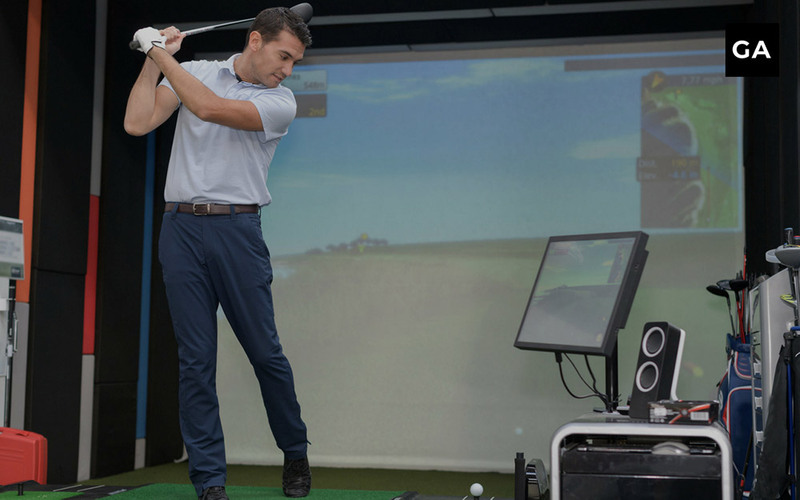 Depending on how sophisticated your simulator is, the computerized system then also provides you with varying levels of important data on each shot: your swing speed, the launch angle of the ball, how far the ball carried in the air, etc. It’s obviously not quite the same as strolling the actual fairways of Royal Melbourne or Turnberry, but it’s the next best thing. There is a lot of sophisticated engineering at work “under the covers.” From the player’s perspective, once the system is installed and set up, all they need to do is to step up, swing, and hit the ball directly into the screen, just as they would at a golf course or driving range. Simple. Their focus is solely on making a good swing and hitting a quality golf shot. But less obvious to the player are all of the many high-tech devices and sensors that are integrated into the full golf simulator system. An array of light sensors, radar, and other motion tracking devices are strategically placed to capture all the details. Once the ball strikes the screen, the information collected by the sensor array is sent to the computer. It’s there that a variety of factors involved with your shot are evaluated – ball speed, shot angle, distance, spin, trajectory, and so on. Some higher-end systems even use infrared optical sensors to monitor your swing movement and offer guidelines on how to improve. It depends. There is a very wide range of options in home golf simulators, beginning with low-end systems costing just a few hundred dollars, all the way up to high-end, premium systems that can cost more than $50,000. For those on a limited budget, or for those not requiring a large amount of data, they will find that the entry-level systems are surprisingly good. And for those who can afford a more robust and full-featured simulator, there are many offerings available for you too. At the low end of the cost spectrum, the Tittle X is the world’s most compact golf simulator system. Unlike the more expensive simulators, the Tittle X simply uses a swing analyzer device that you attach to the included swing stick, or you can attach it to one of your own clubs. There are no expensive launch monitors or projectors. It is not meant to be a full impact simulator, but more of a practice tool with simulator feedback. The swing stick is a high quality short golf club that provides feedback when the club swings, simulating a golf ball strike. 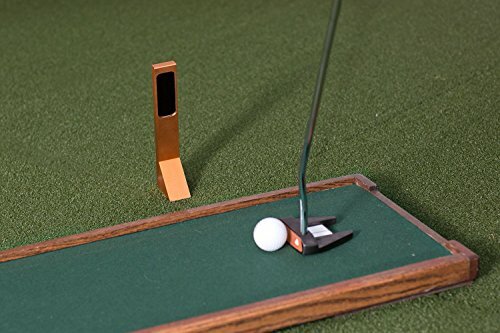 The Tittle X golf device records the swing and plays it back via bluetooth to a PC or Android device. If wanted, you could also then send that simulation data to your TV via HDML. Why it’s recommended: All in all, for the casual user who doesn’t want, or need, a costly full featured golf simulator, the Tittle X provides a lot of bang for the buck. The Rapsodo R-Motion is an amazing golf simulator considering its modest price. Unlike higher priced systems, the R-Motion is run entirely on your PC…no projector or launch monitor is required. The visuals are stunning and very realistic, offering 15 top golf courses and a driving range. It employs a unique methodology that uses small, clip-on R-Motion trackers that attach just below the grip of your club. Make your shot, and these trackers sync with your PC to provide instant swing data. Instant readouts after each shot, including: club speed, face angle, shot distance, swing path, trajectory, and more. Who it is best suited for: budget conscious buyers who still want a very advanced system, and who don’t mind viewing all of the images from a PC. Why it’s recommended: For the price, the R-Motion Simulator is awfully hard to beat. The OptiShot2 is the biggest selling golf simulator on the market. You can play it on your computer, and pair it with either your HDTV or a projector. It comes packaged with 15 top golf courses, and allows play from one to four golfers. There are also 6 different game types to choose from, and it even allows you to select different weather conditions. Who it is best suited for: As with the Rapsodo R-Motion, golfers who want a golf simulator in their home, but who can’t afford the premium ones costing thousands of dollars. Why it’s recommended: OptiShot is the biggest name in home golf simulators, particularly for lower-end units. The OptiShot2 model is the biggest seller in that particular market. 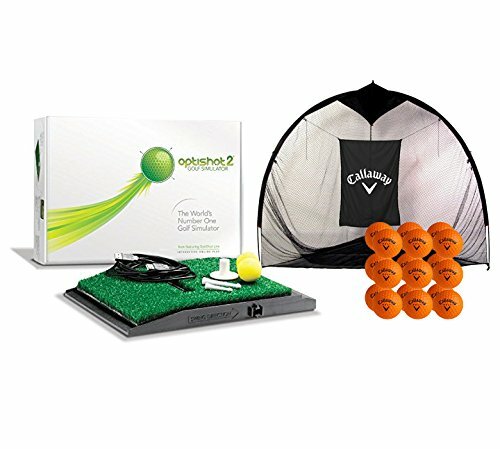 The OptiShot2 Golf Simulator Bundle is the same package described above, but they have also included a Callaway 7 foot hitting net and 18 Callaway HX practice foam golf balls. 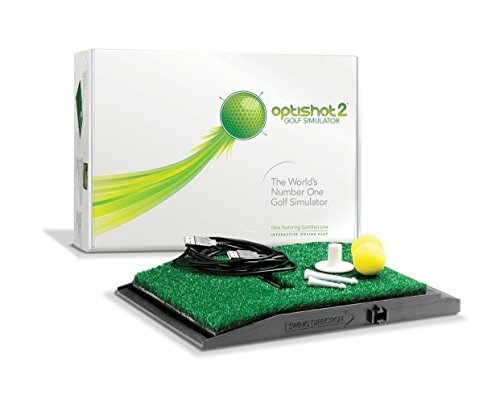 Why it’s recommended: OptiShot is THE name in entry-level home golf simulators. This top-rated unit adds in a hitting net to the OptiShot2 package. Online Tournaments, experience lifelike golf from the comfort of your own home. 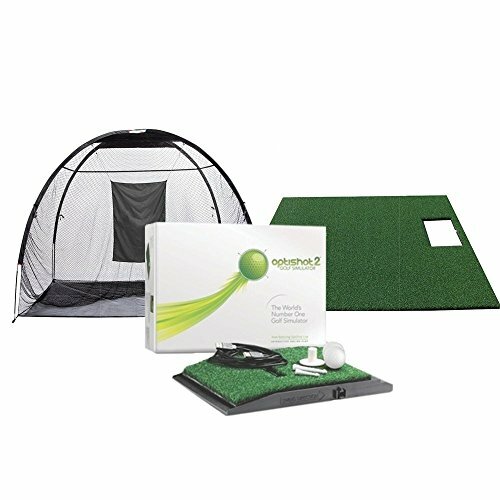 This all-in-one simulator package includes everything you will need to get your golf simulator set up in your home. Feature-wise, it is the same as the OptiShot2 products above. However, in addition to the simulator software and sensors, it also includes a 4’ X 5’ hitting mat and a full 10’ X 8” hitting net. Includes 8 different game types including: Stroke Play, Better Ball, Match Play, Best Ball, Stableford, Skins, Alternate Shot, and Custom Games. This turnkey set-up is still attractively priced for those looking for an affordable solution. Who it is best suited for: Golfers who want a complete golf simulator system (software/net/mat), while staying within a limited budget. Why it’s recommended: It is easy to spend thousands of dollars for fully-featured simulator systems. The OptiShot2 Golf in a Box gives you everything you’ll need in a quality system, but keeps it at a price that is much more cost-sensitive. SkyTrak is the first personal launch monitor of its kind. 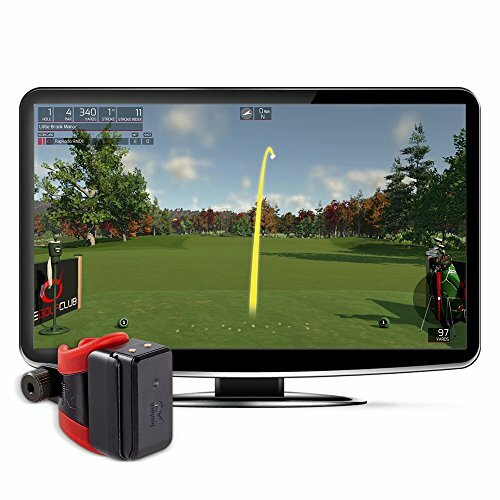 It is a realistic, and real-time, golf practice and play system that connects wirelessly to your mobile device or PC. It accurately captures and displays launch data and ball flight as soon as you hit the ball. You’ll see the ball fly and receive instant feedback on every shot. By simply hitting balls into a net, the revolutionary SkyTrak Personal Launch Monitor captures thousands of data points to deliver high quality ball flight simulations that reflect your actual performance at a fraction of the price of many of the alternatives. Displays ball speed, launch angle, club speed, spin rates, etc. Who it is best suited for: Anyone that wants or needs a personal launch monitor. 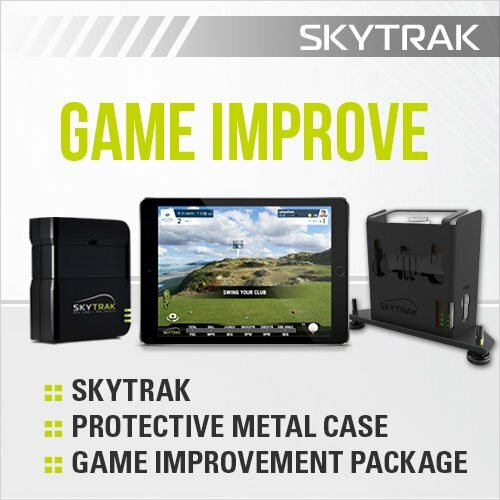 SkyTrak is suited for almost any application that a commercial quality launch monitor can be used for. Why it’s recommended: Golf Digest voted this unit as the “best value” golf simulator on the market. While it may not have all the features of the premium, high-end simulators, it’s awfully close, for a lot less money. Everyone knows that the key to scoring in golf is to putt well. After all, “it’s not how you drive, it’s how you arrive,” right? Well this home simulator is all about fine tuning this most important part of your game. OptiShot Pure Plus is a camera-based putting simulator, manufactured exclusively to perfect your putting stroke. It uses high-speed camera technology to capture the ball distance, direction, club and face angle. Can customize for speed of greens (stimp) and slope. Who it is best suited for: Golfers who want to perfect their putting stroke. Why its recommended: Putting is a critical part of the game and everyone would benefit from specialized training and practice in this vital aspect of the game. The OptiShot Infrared Golf Simulator is combined with the best portable golf studio on the market to create the Optishot Golf Studio. This amazing studio installs without any tools and features the awesome HD impact screen. The OptiShot Infrared Golf Simulator is combined with the best portable golf studio on the market to create the Optishot Golf Studio. This amazing studio installs without any tools and features an awesome HD impact screen. This is a high-end, premium system from one of the best golf simulation manufacturers. Who it is best suited for: The golfer who trusts OptiShot as a premier provider of home simulator systems and who can afford a premium simulation package. Why it’s recommended: This studio package includes everything you’ll need to have a complete, high-end golf simulator experience. 1 1/4 in frame and connectors. Padded seamless poly golf screen 168 x 108. 2 5 x 5 mats. The ProTee Golf Simulator is a premium golf simulator with dozens of state-of-the-art features. This is the current version of a system that has undergone over a decade of development. The high-tech graphics system is incredible, featuring next-generation high-resolution that allows the user to move in real-time around the course. This is in contrast to other systems that only show a static view. After your shot, the virtual 3D graphics camera will “fly” you along the ball’s trajectory to where the ball lies for the next shot. When you hit the ball into the special projection screen, the screen absorbs its energy and it falls to the floor. Its image, however, will continue on from the point of impact on the screen in a continuous smooth flow. This and other amazing technology are what make the ProTee simulator package so life-like. Comes with a professional sensor mat that detects club head speed, swing path, club face angle, swing tempo, ball speed, launch angle, etc. Who it is best suited for: This is a premium golf simulator system for the discriminating golfer who can afford the best that technology has to offer. Why it’s recommended: The ProTee provides the ULTIMATE golf simulation experience. If you can justify the cost, you will have many years of enjoyment from one of the elite systems on the market. How much space do I need for a home golf simulator? If the idea of owning a home golf simulator is starting to have appeal to you, this is an important question. There is no hard-and-fast rule that stipulates precise dimensions, but there certainly are suggested guidelines. Essentially you want to be in a space where you can swing comfortably, and where you are not risking damage to the room with a wayward golf shot. Any area that has adequate room can be used, but simulators seem to find their most frequent usage in garages and basements. There are three things to consider when planning for space: ceiling height, room width, and room depth. Obviously, when it comes to height, the more the better. However, 9 or 10 feet is usually a sufficient height to safely accommodate most players’ swings. Is it possible to put a simulator in an area with less than 10 feet of height? Yes, perhaps, if the primary user of the system is shorter than average and has a flat swing plane. But even if that is the case, don’t forget to consider other golfers who might use the space if you plan on having friends or family members use it also. 9-10 feet or more is good. A safe guideline for width would be about 15 feet. If you expect to hit every shot perfectly, you can get away with less than that. But for those of us who hit the occasional “squirrelly” shot (even those dreaded ones that find the hosel of the club! ), less width might bring your side walls dangerously into play. Another consideration would be if there is a possibility that both right and left handers will be using the system, with one obviously hitting from the left side of the mat and the other hitting on the right. This would effectively expand the width requirement by several feet. All things taken into account, though, 15 feet will usually be an adequate width. The minimum recommended depth of the room you will need is about 15 feet. This includes 1 foot from the wall to the screen, 8 – 12 feet from the screen to the tee, and 6 feet of safe distance behind the golfer. Once again, though, this is just a general guideline. The specific simulator that you buy may call for additional depth due to the type of technology used and the required placement of sensors. It is easy to see why the popularity of home golf simulators has increased so much in the past several years. Probably the single greatest benefit of owning a golf simulator is the ability to play or practice any time you want, regardless of the conditions where you live. It can be dark outside with snow on the ground, but you are able to play to your heart’s content in the warmth of your own home. Most home golf simulators come pre-packaged with a long list of golf courses that you can play, usually including many of the world’s best layouts. Alternatively, instead of playing full rounds of golf, you could elect to simply practice instead by hitting into an optional virtual driving range. This flexibility is one of the main reasons behind the growing popularity of home golf simulators. Today’s home golf simulators are now extremely accurate. Even the more moderately priced units provide very precise information about your ball’s flight. Immediately after the shot is hit, the system will display how far the ball carried, what the speed of the ball coming off your club face was, how much spin the ball had in flight, how high your shot went, etc. And as you progress up to the very high-end simulators, there is a proportional increase in the amount of data available. You do not need a large room to accommodate a golf simulator. As you will see below, home golf simulators can be set up in relatively small spaces. You can play with your own clubs. This is obviously the best way to see maximum improvement, in contrast to using unfamiliar rented equipment. Party time! Social gatherings built around the golf simulator have become very common events. Invite a friend, or create a mini-tournament for a whole group. And not unlike many real rounds of golf, it is not unusual for these group “outings” to feature some “liquid refreshment.” As someone once said, “Golf and a good beverage go together like Romeo and Juliet.” Your in-home golf parties will become the happening place to be! As you can see, there are home golf simulators that are suited to every budget, starting with very affordable low-end units and extending up to deluxe models that provide the ultimate in-home virtual golf experience. If you are a golfer who wants the flexibility of playing and practicing at any time, day or night, rain or shine, then there is a solution for you in the home golf simulators described above. 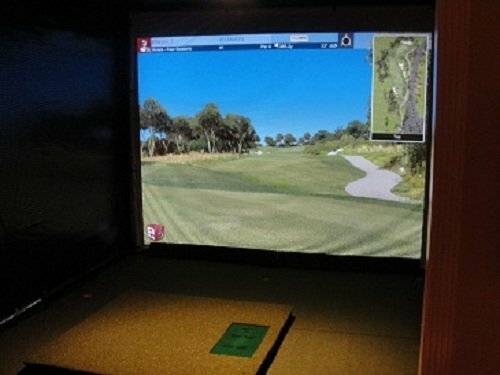 A home golf simulator is the ideal way to train and prepare yourself if you are unable to get out onto a golf course regularly. There are many models on the market so read through these reviews before making your decision.